- IWE 5th World Series (February/March '73) = Gagne competed in the league, which was won by Rusher Kimura. - AWA Comiskey Park (September 7, '74) = Gagne fought to a Draw with Buddy Wolfe. - AWA Comiskey Park (August 27, '76) = The High Flyers (Gagne & Jim Brunzell) & Wilbur Snyder defeated Ox Baker, Baron von Rashcke, & Mad Dog Vachon. - AWA Chicago Stadium (June 26, '76) = Gagne took down Bob Orton Jr.
- AWA Comiskey Park (July 14, '80) = Gagne won, via Countout, over Bobby Heenan. 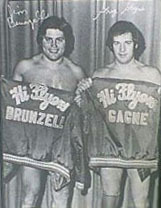 Later on, Gagne competed in a Battle Royal, which was won by Jerry Blackwell. - WWF Showdown At Shea '80 (August 9) = Gagne took down Rick McGraw. - AWA StarCage '85 (April 21) = Greg & Verne Gagne beat Nick Bockwinkel & Masa Saito. - AWA/NWA Star Wars (August 16, '85) = Gagne & Curt Hennig won over Nick Bockwinkel & Ray Stevens. - AWA SuperClash (September 28, '85) = Gagne, Scott Hall, & Curt Hennig defeated Nick Bockwinkel, Ray Stevens, & Larry Zbyszko. - AWA WrestleRock (April 20, '86) = Gagne & Jimmy Snuka won a "Steel Cage" Match over Bruiser Brody & Nord the Barbarian. - AWA Brawl In St. Paul (December 28, '86) = Gagne, Scott Hall, & Leon White defeated Larry Zbyszko, Super Ninja, & Mr. Saito. - AWA Rage In A Cage II (April 16, '88) = Gagne stayed the AWA Television Champion, but lost, via DQ, to Paul Diamond. 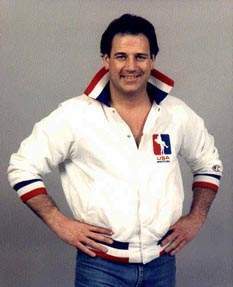 - AWA SuperClash III (December 13, '88) = Gagne won the AWA Television Title, winning, via Countout, over Ronnie Garvin. - AWA War In The Windy City (June 23, '89) = Gagne fought to a Draw with the AWA World Heavyweight Champion, Larry Zbyszko. - AWA World Tag Team Title Tournament (October 1, '89) = Gagne & Paul Diamond defeated Mike George & Johnnie Stewart, then lost in the finals to the Destruction Crew. This was the match where Kokina Maximus (Yokozuna) came out and squashed Gagne's leg (kayfabe), sending Gagne into retirement.